This is a piece I did last week. Arrietty in the Flower garden was my attempt to capture the adventure and wonder that was Ghibli’s Arriety. Arrietty is Arrietty, titled The Borrower Arrietty (Japanese: 借りぐらしのアリエッティ Hepburn: Kari-gurashi no Arietti?) in Japan and The Secret World of Arrietty in North America, is a 2010 Japanese animated fantasy film directed by Hiromasa Yonebayashi and scripted by Hayao Miyazaki and Keiko Niwa. It is based on The Borrowers by Mary Norton, an English author of children’s books, about a family of tiny people who live secretly in the walls and floors of a typical household, borrowing items from humans to survive. The film stars the voices of Mirai Shida, Ryunosuke Kamiki, Shinobu Otake, Keiko Takeshita, Tatsuya Fujiwara, Tomokazu Miura, and Kirin Kiki, and tells the story of a young Borrower (Shida) befriending a human boy (Kamiki), while trying to avoid being detected by the other humans. Toshio Suzuki produced the film and Studio Ghibli provided the animation. I enjoyed this movie so much and I really wanted to make an art that will be a good representation of it. Arrietty is a character full of defiance and strength and I see a lot of myself in her. SHe’s a rebel and she does everything straightforward. SHe’s impulsive and doesnt really think about what she will do next and just dives into what she feels is right at that moment. Arrietty is a good representation of teens and youth. 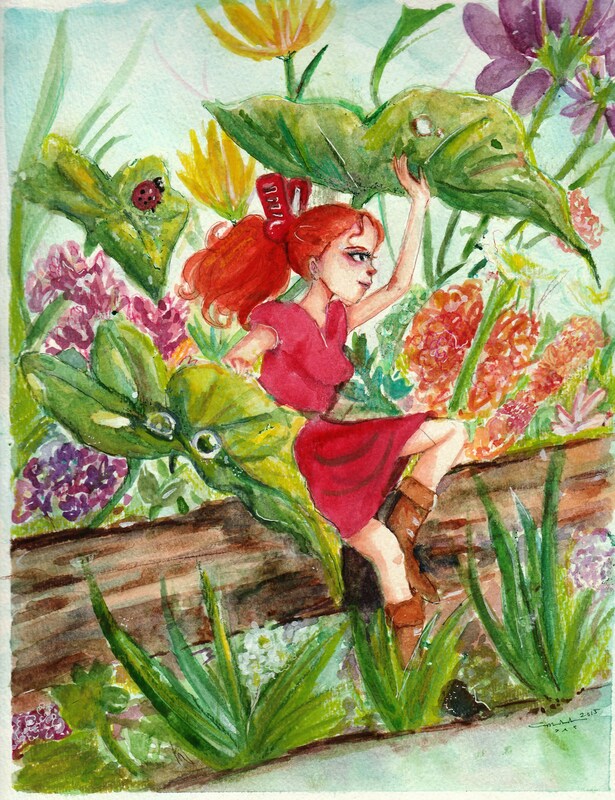 The pose for this painting was referenced from an original picture of Arrietty. I decided to kick it up a notch and create flowers around her and a small puddle of water .I am learning detailing and patience. Patience, yes, there are so many details to do in this picture. And I wanted it to achieve Arrietty’s sense of adventure and bravery, so it was pertinent that I dont mess up the face. hehe It was pretty hard as i was doing it on A4 paper, I should have done so in A3 where I can control the paint better but, yeah… it didn’t happen so I had to be careful and use my 5/0 brush to achieve finer details. Also, flowers werent my forte and detailing them seemed to be bothersome, but i had to do it for this picture and most flowers i painted on directly without drawing any of them. So, i took a lot of risks. I wanted to do more for this picture and wanted more detail, but I do think it says a lot about how far Ive gone as an artist right now. Í liked how Arrietty looks in this picture and though its not as perfect as i see it in my minds eye, I love it. I am not perfect yet, and like arrietty i can be impulsive, emotional and random. But I am learning. There is so much more patience to be learned. So much more technique so much more detailing i need to learn. And I am willing and I hope I can do this. My next project is Kiki.